Of all the different eyeliner types out there, gel liners would have to be my favourite as they are easier to apply than liquid, and give a more intense line than a pencil. Up until recently I'd been using the Maybelline gel liner, but I was recently sent this SHE Gel Liner* to try and now I'm definitely ready to switch! "Super smooth gel formulation allows you to define your eyes with precision without pulling or tugging. The unique formula provides intense colour which quickly dries to a long wearing, water resistant finish." Those of you not familiar with SHE, it is an Australian brand established in 1996 which uses natural and aromatic oils in their products, and they don't test on animals. The brand is sold at selected Priceline stores. The liner comes with a built in applicator brush that is actually of good quality. I normally discard any brushes included with eye kits, but the one included with this is dense, small and tapered making it perfect for drawing straight lines. The brush is hidden in the lid, which makes it perfect for traveling as you don't have to worry about carrying an extra brush for your liner. 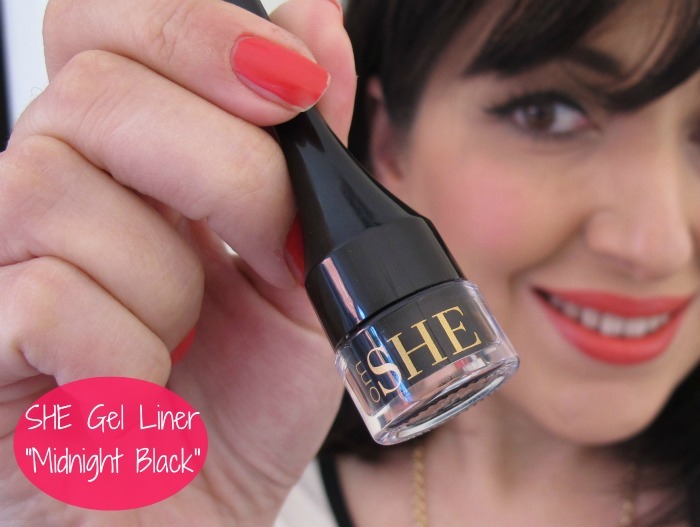 The SHE gel liner is the smoothest formulation I've ever used, it seriously glides on without dragging. I think this would be perfect for people with oily lids as it's long lasting, and once applied it dries fairly quickly and won't budge. It stayed put on my top lashline all day until I was ready to wash it off. Actually truth be told, being quite lazy at the moment (call it pregnancy fatigue) I just used makeup remover wipes and it came off fairly easily despite being budge-proof while on the lids. Absolutely! The price is very reasonable, the quality is fantastic, it's not tested on animals and it's a local brand so what more can I ask for? MAC Studio Sculpt Foundation in NC25 // MAC MSFN Powder in Medium // Illamasqua Blush in Nymph // Too Faced e/s in Like a Virgin and Satin Sheets // SHE Gel Liner // Australis Voluptulash Mascara in Blackest Black // Rimmel Eyebrow Pencil in Black/Brown // Rimmel Lipstick in Kiss Me. Have you tried anything from SHE? What's your favourite type of eyeliner? *PR Sample. Not affiliated with the brand or its stockists. Of course aside from the perfect eyeliner the next thing I noticed was the lipstick on you - lovely! At the moment I've got a She handcream in my handbag and it has an unusual natural herbal scent but otherwise it's quite nice. Hahaha of course YOU would notice the lipstick! It's just my good ole Rimmel Kiss Me, an easy to wear red. 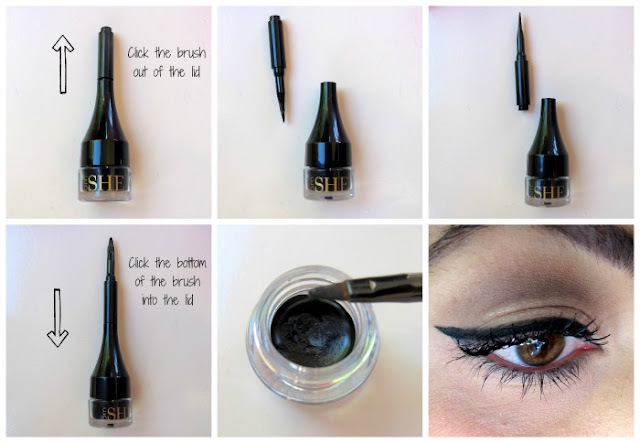 I haven´t tried anything from SHE, but this liner looks great! looks really similar to the Rimmel Gel eyeliner exact packaging but seems to work really well! Jealous! Having oily lids, this sounds like a total dream to me. You're looking great by the way! I love the shape of this brush! You look AMAZING Lilit! Nice review. Your looking gorgeous. I like that SHE gel eye liner.